As part of the school's Maker Lab, Marin Country Day students spend the last few weeks of school building projects. The month of May can be a tough time for schools. The end of the year brings mixed emotions for students, teachers and parents, as they prepare for transition into the summer months. Keeping the same routines can be reassuring for some, but recasting school in terms of time and space can galvanize students and teachers and launch them into the summer full of energy and inspiration. One school in the Bay Area is rethinking how to finish the year. 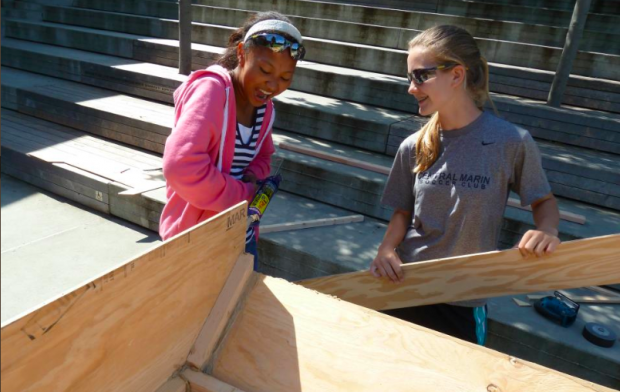 Instead of proceeding with classes as usual, Marin Country Day School organizes a variety of projects for 7th and 8th grade students that provide opportunities to dig deep, build, learn and perform together. "It feels like the first day of school all over again, with the same excitement and energy of a new schedule and new beginnings," says Ted Saltveit, Upper School English Teacher and 8th Grade Class Dean. "Projects come at just the right time, when motivation is waning and students need a kick start and re-ignition." That's not a bad feeling this time of year, as the school builds a bridge to the summer months in order to continue to cultivate a love of learning. The projects inspire risk-taking and hands-on learning by breaking down the traditional classroom walls and build trust between teachers and students. "It feels like the first day of school all over again." Students produce an entire play, and do everything that entails: write, perform, build sets/costumes, sing, dance and be a part of an original production of their own design. Students explore water dynamics in boats on the ocean, understand steering, traction and locomotion in cars on land, and explore aerodynamics in the air. To do this, they go kayaking, ride in boats, get into racecars and wind tunnels, then apply what they know. They work as part of a team of designers pitted against other designers to travel quickly and efficiently. Marine science students learn how oysters are farmed, why elephant seals are so loud and how El Nino is affecting mole crab populations at nearby Rodeo Beach. Students spend two nights in Point Reyes and travel around the Bay Area for field trips playing the role of marine scientists, and learn about environmental stewardship. Food-focused students work on food production, appreciation, culture and preparation, digging into the concept of farm to table, looking closely at the food footprint, debating and considering the push to eat local. Students write and document their experiences as they visit local markets and stores and meet with chefs to further understand the complexity of food production and distribution. Students prepare different meals for members of the community. CSI Crime Scene Investigation gives students the opportunity to become a forensic scientist and learn about crime-solving techniques. Students solve a crime and participate in a mock trial that includes analyzing evidence, fingerprints, hair and fibers. Students learn useful skills that interrupt the flow of disposable culture: to repair, repurpose, rethink and reuse items. Students choose one way to make changes in their own lives by learning basic wood-working techniques, sewing skills or to make personal care items such as soap, lip balm and toothpaste. Using a variety of handmade original artwork and the computer programming language Scratch, students make things jump, spin and move. Students learn about different forms of service engagements and why service matters. As part of their work, they use design thinking principles, including identifying desired outcomes, identifying stakeholders and allies, defining appropriate action steps and creating a brief "movie trailer" to advocate for their issue focus, agency and project. Students create a documentary illustrating the 7th grade experience. Students reflect on their school year and create an artistic commentary using images, interviews, short videos, music, animation or other media tools of their choice. The school year ends with the sounds of saws buzzing, kids singing, and the sweet aroma of food. Matt Levinson is the Head of the Upper Division at Marin Country Day School in Corte Madera, Calif. and the author of From Fear to Facebook: One School’s Journey.